David Kitson looked as though he wouldn’t hurt a fly, but in his day he had been a bomb-instructor for the African National Congress’ military wing and spent 20 years in prison. His interrogators did not know he was a member of the liberation army’s high command. “They thought I was one of those middle-class fuddies who get involved in things,” Kitson, who has died aged 91, once said. There was little thought of revolution when he studied mechanical engineering at Howard College, Durban (now KwaZulu-Natal university), but it was a useful preparation. Graduating in 1942, he served “up north” as a sapper with the South African army. Thus his future adversaries taught him how to prepare explosives. After the war he moved to London – where his Jewish father had been born – working for de Havilland Aircraft as a draughtsman. He was active in the engineering union Tass, while doubling as secretary of the Communist party branch in Hornsey, north London. Tass sponsored him for two years at Ruskin College, Oxford. Afterwards, when at British Oxygen, he was offered promotion on condition he end his union activities. He refused and was sacked. After that, jobs were difficult to find. He married Norma Cranko, a South African Jewish woman who was also active in the Communist party, and with her he returned to South Africa in 1959, ostensibly to introduce their son, Steven, to his grandparents. Within months, the police fired on unarmed protesters at Sharpeville, killing 69. There was now no thought of returning to Britain. Kitson’s first allegiance was to the Communist party, which, like the ANC, had been driven underground. When the ANC’s armed wing, Umkhonto we Sizwe (MK, or Spear of the Nation), launched its sabotage campaign in December 1961, Kitson was teaching the bombers their trade. He was a dependable behind-the-scenes cadre, not a coal-face primer of bombs. But when virtually the entire leadership of MK was arrested at Rivonia, on the outskirts of Johannesburg, and several leading communists had fled the country, the lower ranks were catapulted in to replace them. Kitson was now one of four members of a high command directing the revolutionary struggle. Arrest was inevitable. He held out for 131 days. Kitson was not subjected to intense physical torture but did suffer interrogation. “With modern methods they are going to get something out of you sooner or later,” he once told me, “so you proceed with a series of lies.” He gave away nothing of importance, managing to withhold his membership of the high command. Norma was held for three weeks. His lawyers thought hanging was a distinct possibility, so the 20-year sentence (for sabotage and membership of the Communist party) came almost as a relief, even if there was no prospect of remission for good behaviour. Pretoria local prison housed the white “politicals”, and their treatment was nothing like that meted out to black prisoners on Robben Island. But there were bullying warders and a vindictive minister of justice stopped their studies for three years. Kitson acquired arts and science degrees (in mathematics), and was even allowed to study Russian, before the authorities cottoned on. He remained a hardliner, not overly keen on the “liberal nonsense” spouted by his student neighbours likewise jailed for sabotage. He was philosophical about his plight, regarding himself as “a casualty of the conflict”, and he made no objection when Norma divorced him, moved to Britain, and married fellow South African Sidney Cherfas. However, when Steven visited from London and was arrested, allegedly for sketching the prison, Kitson’s equanimity was tested. Norma later divorced Sidney, amicably, and remarried David when he was released from prison. Arriving in London, Kitson found himself in a political cauldron. Norma had founded the City of London anti-apartheid group, whose non-stop protests on the pavement outside South Africa’s Trafalgar Square embassy had become a tourist attraction. The confrontational style incurred the wrath of the sedate Anti-Apartheid Movement’s national leadership. In return, Norma treated her critics with disdain. The ANC and the influential London cell of the South African Communist party told Kitson to denounce his wife. He refused. The couple were suspended from the ANC, a speaking tour of Britain was cancelled, and his old union, Tass, had the offer of a lectureship in mathematical statistics at Ruskin College withdrawn from him. David and Norma moved to Zimbabwe. In time, at the behest of Walter Sisulu and Nelson Mandela, the couple were reinstated by the ANC and honoured as “veterans of the struggle”. It was half-hearted. There was no invitation to Mandela’s historic inauguration. After Norma died in 2002, Kitson returned to Johannesburg. 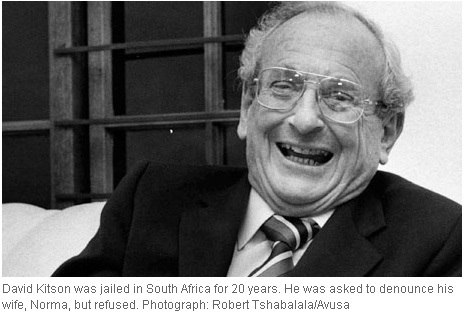 The hero of the struggle died a non-person in the new South Africa. He is survived by his daughter Amandla. Steven died in 1997.